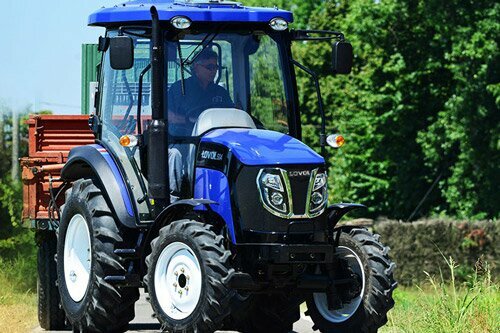 Lovol’s 35HP tractor is powered by a 4 cylinder EPA approved engine. These are the last of the small high torque engines with minimal emission controls. Hydraulic power steering with an 8 forward and 8 reverse shuttle shift transmission give the TE354 great maneuverability for those tight spaces. The TE 354 comes with a step-through heated cab and 360-degree visibility to make working in your tractor a breeze. Lovol Tractors West is pleased to introduce the TB series from Lovol. These tractors are powered by the Japanese Shibaura Tier IV Final, 4 cylinder, turbo charged, intercooled engine. From their roomy new style climate controlled cab to the 12+12 synchronized shuttle transmission, these tractors are a welcome addition to the Lovol line up. The last of the high torque engines with minimal emission controls, and no complicated electronics to fail. The TD824 is an 82 HP tractor powered by a turbocharged inter-cooled engine, with a 16 forward, 8 reverse shuttle transmission with a creeper gear. The roomy climate controlled cab is perfect no matter what the outside conditions are. The TD824 has the last of the high Torque engines with minimal emission controls, and no complicated electronics to fail. The TD824 features a 540 and 1000 independent PTO and also has a 5000lb three point hitch. The TD824 comes with a complete 2-year warranty serviced from our Nisku location. Get those round bales moved!! !